Tenchu Wrath of Heaven is the latest game of the Tenchu series that revolves around the Azuma ninja clan who have vowed to fight injustice in Feudal Japan. When a mysterious feudal lord named Tenrai has amassed an army of ninjas and demons to take over 16th century Japan. Your master, Lord Godha has once again called you into his service to stop this madman and defeat his army of darkness before not only Japan but maybe the world if lost. Tenchu Wrath of Heaven offers gamers the choice of three different characters to play, Rikimaru, Ayame and a mysterious bonus character who solely relies on martial arts to defeat his victims. Rikimaru is the leader of the Azuma Shinobi-ryu ninja-sect, a powerful and deadly ninja who uses any means possible in completing his task. Whereas Ayame is the beautiful yet deadly ninja who uses acrobatics and her dual ninja-to's to defeat her enemies. Depending on which character you select will not overtly change the outcome of the story but it will have an effect on how you will complete your missions. That is, each character has their strengths and weaknesses and these must be used in conjunction to complete the game. Before I start, I must confess that this is the best damn fun I have had on ages on the PlayStation 2 as it is probably the most addictive and fun game to come out in a long time. Although the replay value diminishes after you have completed the game, the introduction of the bonus character will prolong the longevity of the game because he is extremely different from Rikimaru and Ayame. Tenchu Wrath of Heaven can only be described as an arcade strategy game or for those uninitiated, Metal Gear Solid meets Feudal Japan. The game starts with a basic mission, for example you must defeat an evil and ruthless merchant who has acquired a gem of power that in the wrong hands could mean trouble. The only problem is, you must somehow sneak into his fortress, defeat his soldiers without being seen and finally defeat the merchant. Your characters have a health meter that ranges from 0 (dead) to 100 (healthy) that fortunately can be replenished by health vials and items that are littered throughout the mission. You also have a Ki Meter, a sixth sense of the ninja that allows you to see the emotions of people nearby. These emotions are displayed on the screen by icons that include ? (presence of an enemy), ! (you have been spotted but have not been identified as a threat), !! (You have been spotted as an intruder) and I? (An enemy has been alerted to suspicious sounds). Once you have mastered the Ki system of Tenchu, you can then use this system to your advantage and hopefully disable your foes without them alerting others. The combat in Tenchu can be performed in three different ways. The first but hardest way is to use stealth and items in your inventory to distract, maim and disable your foes. For example, if you sneak up to a soldier without being heard, you can then perform an impressive stealth attack, depending on which character you select. For example, Ayame can use her two short swords to slice a soldiers neck, use her acrobatic skills to break their neck or a variety of other deadly manoeuvres. You will have successfully implemented this attack when you see an in game cinema of your character assassinating their victim. The other ways to attack is through melee attacks such as combos, kicks, weapons and acrobatics or to use long distance weapons such as arrows, darts or grenades. You can finish the mission in a variety of ways, either by the Hollywood style of just barging into a fort with swords and blow darts blazing or by using stealth that not only benefits you in the long term but also gives you a higher mission score. You are awarded points on how well you perform during the game, by performing stealth kills and not being spotted, not only awards you with a higher score at the end of the mission but also allows you to increase your characters attributes faster. The only downside to the game is that an in game save would of been extremely helpful but fortunately the levels are littered with ninja rebirth items that are basically free lives. Sometimes it does get frustrating because you have been playing for almost 30 minutes and would like to have a break but you can't. That said, your game is saved at the end of each mission. In Tenchu, you control you characters via the left analog stick, while the right analog stick is used to control your camera angles. The R1 button is used to enter stealth mode, while the R2 button is used to auto lock onto an enemy or to strafe. The triangle button is used to aim or use an item, Square is used to attack, X to jump and Circle to block or use a secondary attack. 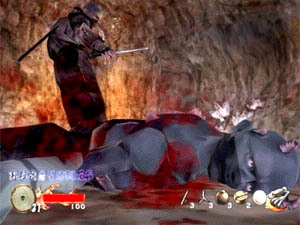 Tenchu also supports a variety of different items in the game that must be used in conjunction to successfully complete the game. The most useful accessory in the game is the grappling hook that lets you climb walls and access areas in the game that climbing is impossible. One of my most favoured inventory items is poisoned rice that when thrown on the ground near an enemy will paralyse them if eaten that allows you easily dispatch them. Before each mission, you are allowed to select a variety of items that can be used on a mission such as blow darts, poisoned rice, health vials, etc. Also during the mission, you can find additional items scattered throughout the gaming environment or on enemies you have just defeated. Graphically, Tenchu Wrath of Heaven is a beautifully created game that accurately portrays feudal Japan both in its playing environments and its mythology. The characters in the game contain an extremely high polygon count to produce some of the most realistically looking characters to have ever graced the PlayStation 2. Add some impressive texture details and you have a match made in heaven. The backgrounds of Tenchu are extremely impressive with large amounts of detail such as densely created forests or high resolutions textures of rocks and stones. 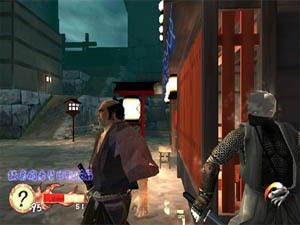 As just about all the missions in Tenchu are at the night, the game also offers gamers a variety of different lighting effects that is implemented well into the game. Although there are some beautifully created CGI cinemas in the game, the majority of cinemas in the game uses the in game engine that is sometimes hard to tell whether its CGI or in game graphics. The sound effects of Tenchu contain all the noises you would expect to hear in a blockbuster Hong Kong movie such as the sounds of swords hitting swords, characters leaping through the air or noises of a Japanese forest. The only thing that some gamers might find amusing or disturbing in the game is the voice acting of some characters in the game with their Americanized style of voices. Although the characters do sound like they are from Japan, they do have this strong American accent. I thought it was kind of amusing and actually suited the game but hey...that's just me! 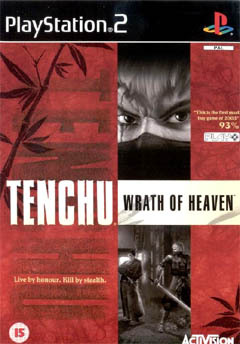 So where does Tenchu Wrath of Heaven fit in the grand world of PS2 gaming? Activision has quite a bit to answer for as I'm trying not to play this game as often as I am. The game is quite addictive and even when you get stuck on a mission or die halfway through a mission, you don't get annoyed but just start again. Tenchu contains some amazing graphics, awesome gameplay and a very interesting storyline that has had me addicted for hours and because I suffer from schadenfreude, I would highly recommend this game to everyone. A must have for your PlayStation 2 collection!